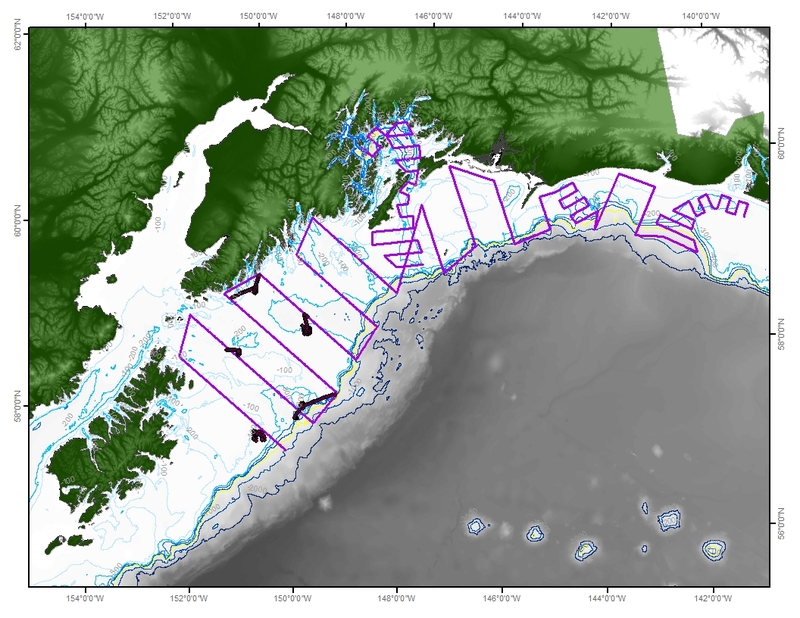 The main goal of Leg 3 of this mission is to survey the mid-water portion of the pollock population using acoustics and trawls. Pollock usually inhabit the middle of the water column down to the seafloor. This mid-water survey is typically carried out once every two years. Another NOAA Fisheries survey observes the pollock that live close to the seafloor using bottom trawls. The Oscar Dyson carries three different types of trawling nets for capturing fish as part of the mid-water survey: the Aleutian Wing Trawl (AWT), a mid-water trawl net called the Poly Nor’Eastern bottom trawl, a net with special rubber bumpers so it can bounce along the ocean floor; and the Methot, a small encased net that gathers very small ocean creatures such as krill. 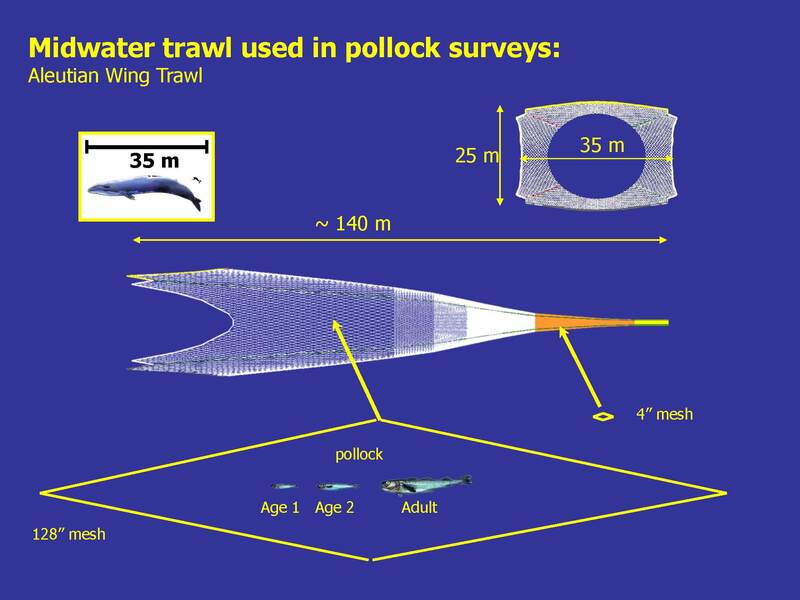 I will be discussing trawling with the AWT in this blog. I am going to describe how the net goes into the water, step by step. Then you can watch a short sped-up video that my fellow Teacher at Sea mate, Julia Harvey, created. She works the night shift (4 pm to 4 am) on the same cruise that I am on. When the net is deployed from the ship, the first part of the net to hit the water is called the codend (see the far right of the diagram above). 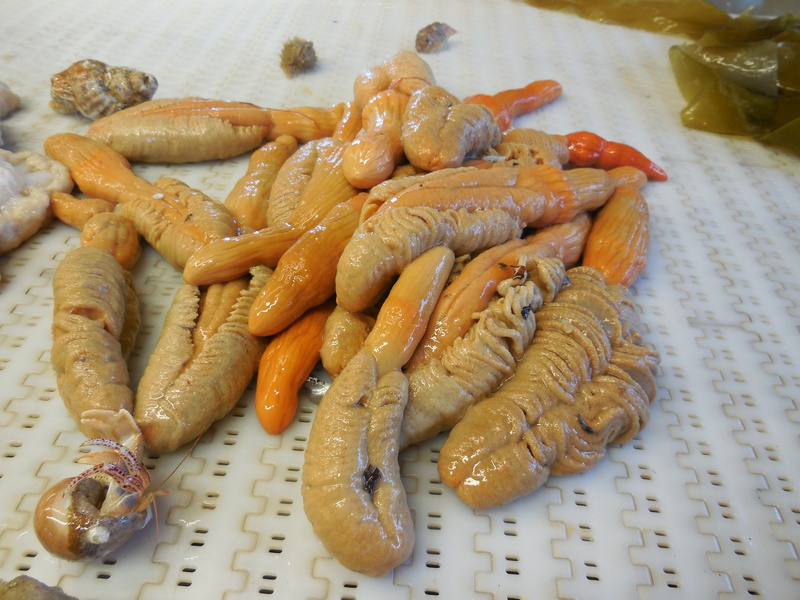 This is where most of the fish end up after the trawl. The mesh size of the net is smallest at the codend (about 1 cm) and gets larger as it approaches the doors (about 1 m). A trawl camera is the next major part that hits the water. This is a pair of cameras that help scientists identify and measure the fish that are caught in the net. 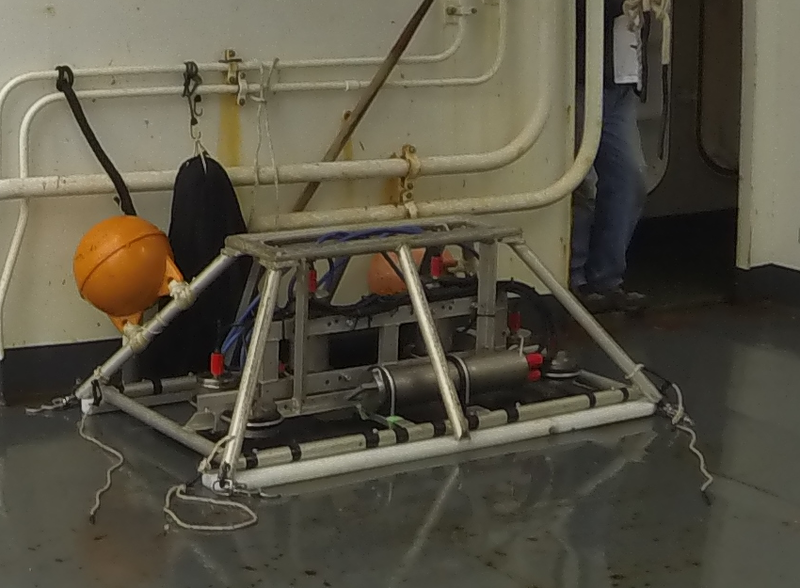 This technology can also be used to help scientists validate their biomass estimate from trawling sampling counts. This piece of equipment has to be clipped into the side of the net each time the crew is instructed to deploy the AWT. The next piece of the net to hit the water is the kite which is secured to the head rope. Attached to the kite is a series of sensors that help the scientists gather data about the condition of the net including depth, size, and shape underwater. The major acoustic sensor, affectionately termed the turtle, can tell the scientists if the fish are actually going into the net. 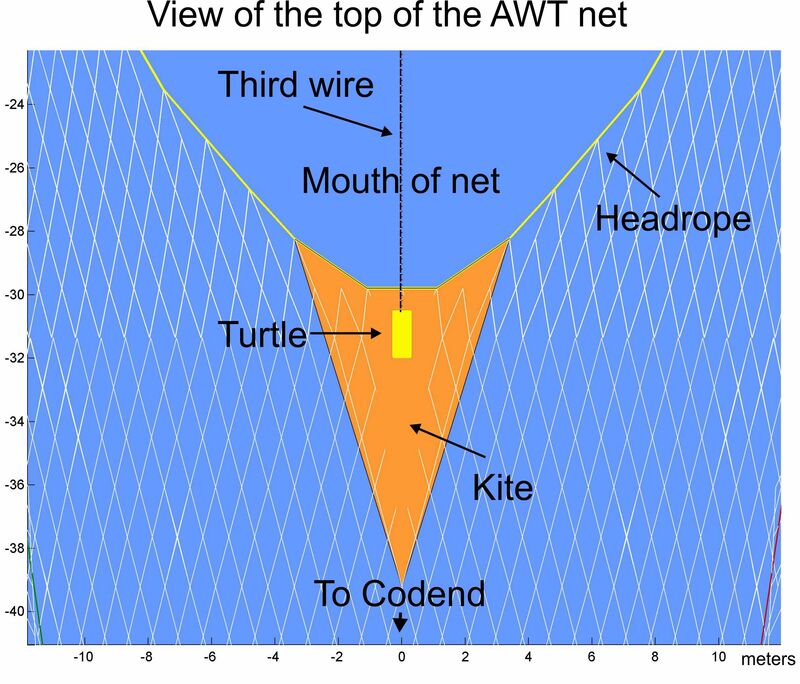 Close-up view of the AWT scale model to highlight the kite and the turtle that ride at the top of the net. The third wire holds the electrical wires that send data from the turtle to the bridge. Once the kite is deployed, a pair of tom weights (each weighing 250 lbs), are attached to the bridal cables to help separate the head rope from the foot rope and ensure the mouth of the net will open. Then, after a good length of cable is let out, the crew transfers the net from the net reel to the two tuna towers and attaches the doors. The doors act as hydrofoils and create drag to ensure the net mouth opens wide. The scientists use acoustic data to determine at what depth they should fish, then the OOD (Officer on Deck) uses a scope table to determine how much cable to let out in order to reach our target depth. Adjustments to the depth of the head rope can be made by adjusting speed and/or adjusting the length of cable released. 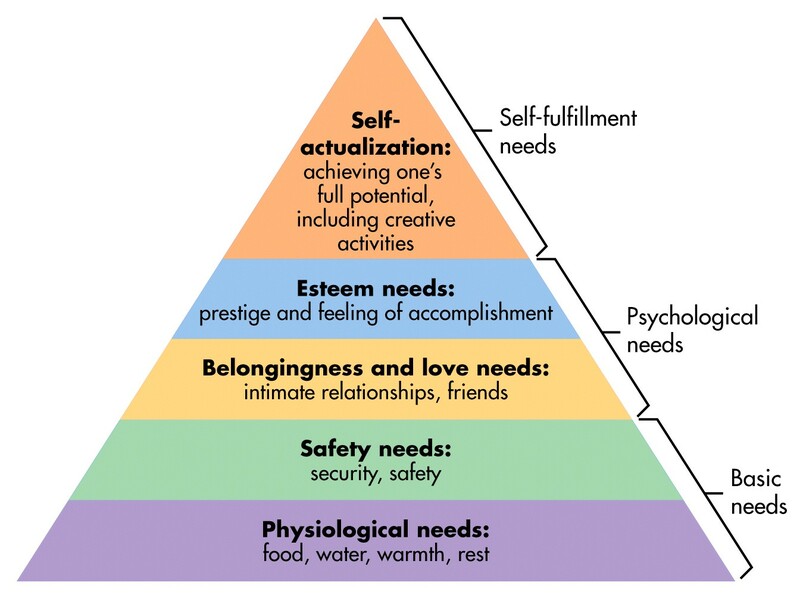 Continuing with Maslow’s hierarchy of needs, I will discuss some of the ways that the need of belongingness is met on the Oscar Dyson. There are several different ways that comaraderie is fostered on the ship: teamwork, common areas, meal time, and celebrations. 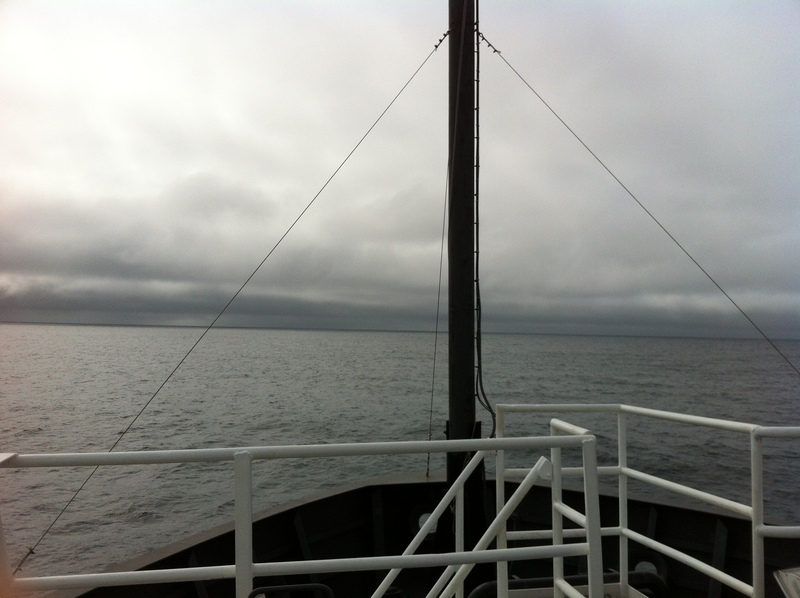 Remember the main goal of Leg 3 of this mission is to survey by acoustic-trawl the mid-water portion of the pollock population. To ensure that the goal of the mission is accomplished, several crews are necessary: engineering, officer, deck, and science crews. People assigned to a crew work together, and there is cross-talk between crews. For example, on the bridge where the officers work, there are two to four people navigating the ship and instructing the deck crew. The deck crew works together to put out and pull in the trawling nets, and the engineering crew works together to make sure the ship is operating properly. Similarly, the scientist crew members consult with each other while: reading the acoustics on the computer screens; deciding when, where, and how long to trawl; determining the best way to process the trawl; and reconciling the “catch” with the acoustical data. The collaboration within and between the four crews mimics a sports team that has offensive and defensive strings working together to maintain their positions to accomplish a common goal. The ship is like a house with many rooms. Most of the staterooms (bedroom/bath) are shared. In terms of “living space” there is one dining area (called the galley), a conference room with books where people meet for drills or quiet work, a movie room, a laundry room, and an extra rest room. Because all these areas are shared, “ship etiquette” is followed, meaning that every individual keeps his or her space neat and also keeps the other common areas clean and organized. 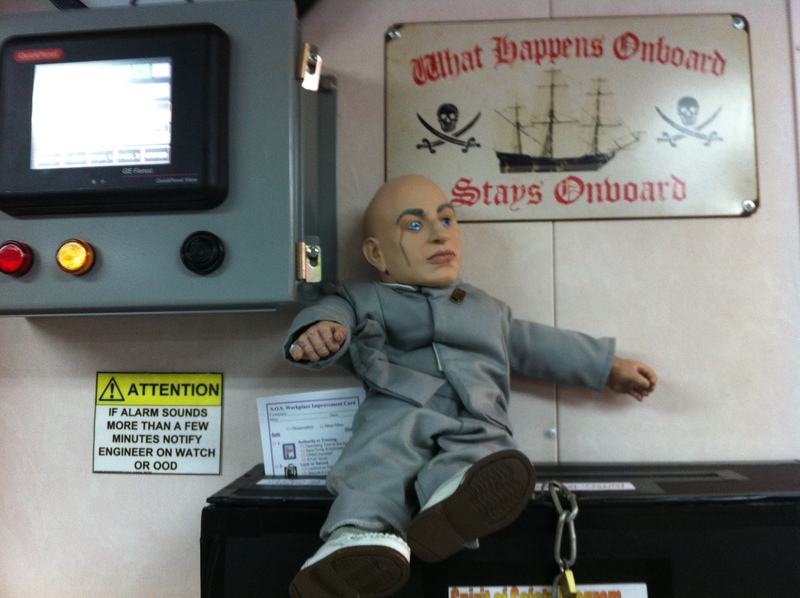 Sometimes, reminders are placed in areas where ship etiquette needs polishing. 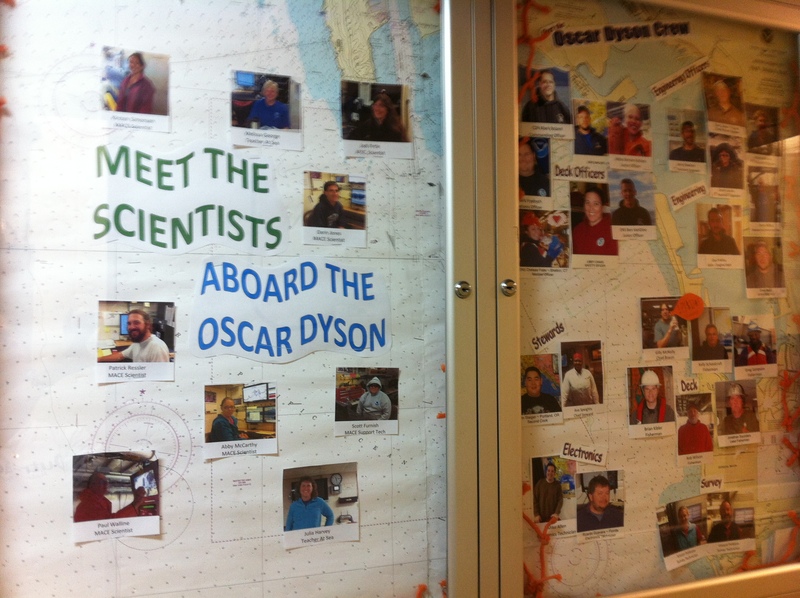 Meals on the Oscar Dyson are during one hour windows three times a day. Breakfast is served from 7 to 8 am, lunch 11am to noon, and dinner 5 to 6 pm. Unless people are sleeping or actively involved in trawling or processing, they eat at these times. Therefore, mealtime is a time to chat, joke, ask questions, and tell stories. We have had three celebrations. Two of these were for birthdays celebrated on the ship. The stewards made a cake for dessert in one instance and hosted an ice cream social in the second. Another celebration was when we were in Prince William Sound to pick up net repair supplies. Because we were near land for the first time in many days and the sun was shining, many people came on deck at the same time to take pictures. Some spotted porpoises which added to the excitement. Fellow Teacher at Sea, Julia Harvey, captured a wonderful video of this event. The ship stewards are the people who plan and prepare the meals for those on board. 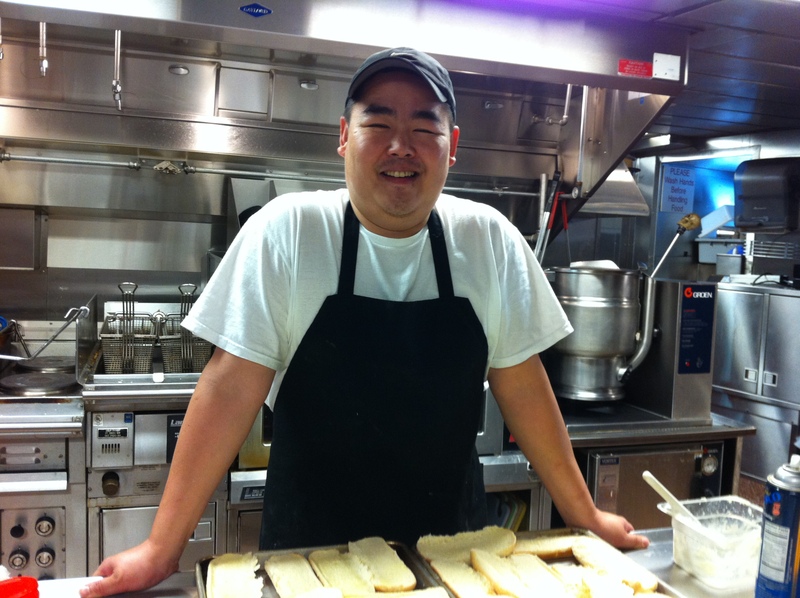 Adam (below) is the second cook on the Oscar Dyson. He worked in various restaurants in Portland before coming to NOAA as a General Vessel Assistant (GVA) helping with the different crews on various ships as needed. When the spot as a steward opened on the Oscar Dyson, Adam got the job. He has taken various NOAA training courses for stewardship and is on the ship nine months out of the year as it surveys both in the Bering Sea and the Gulf of Alaska. Today’s episode of Trawling Zoology features the animal family, Cnidaria. 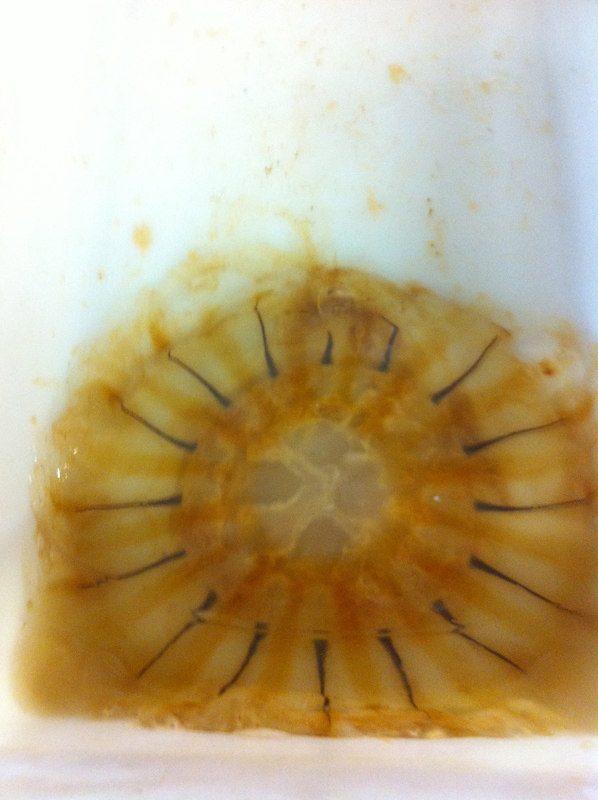 Cnidaria is a word that originates from the Greek word cnidos which means “stinging nettle.” Although the cnidarians are a very diverse family, all the members contain nematocysts (combination of Greek words nema meaning “thread” and kystis meaning “bladder”), basically barbed threads tipped with poison. 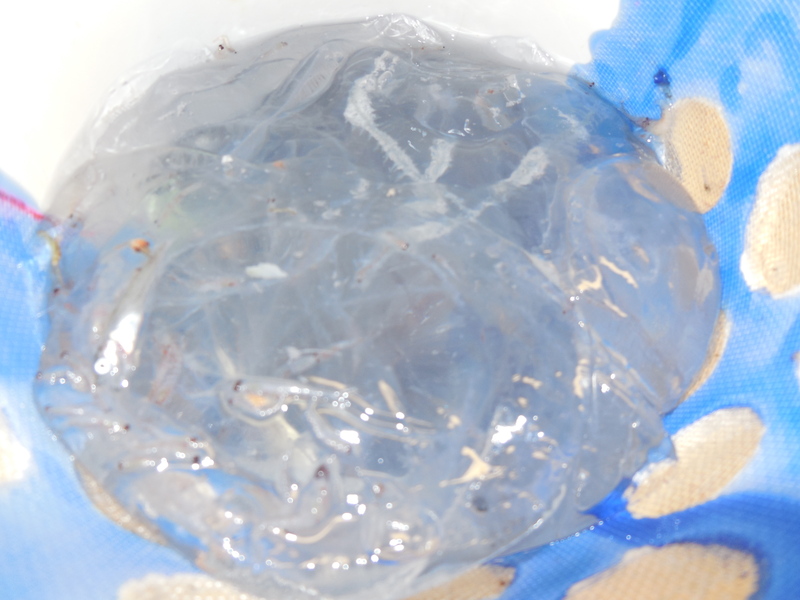 If you have ever been stung by a jellyfish, you have felt this stinging sensation. There are four very diverse groups of cnidarians: Anthozoa which includes true corals, anemones, and sea pens; Cubozoa, the amazing box jellies with complex eyes and potent toxins; Hydrozoa, the most diverse group with siphonophores, hydroids, fire corals, and many medusae; and Scyphozoa, the true jellyfish. We have brought up several members of these groups in our trawling. 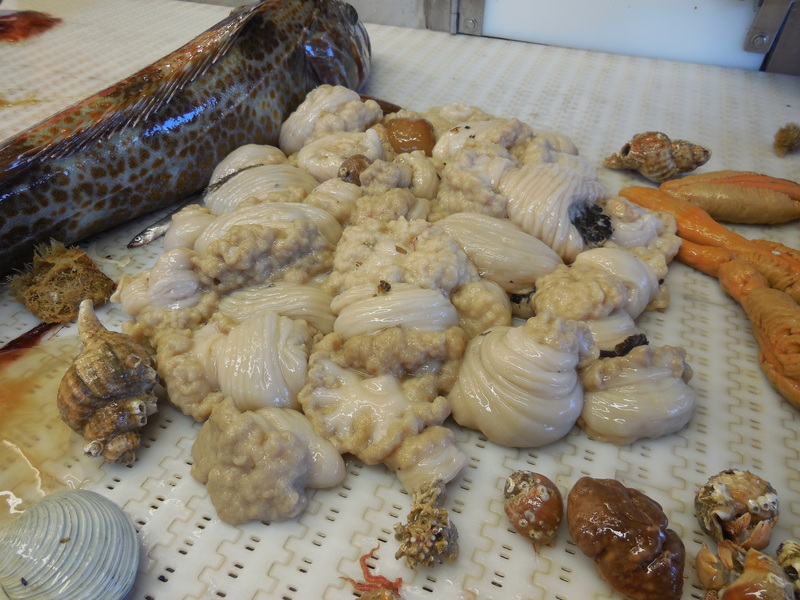 Anthozoa: We have brought on deck both sea pens and sea anenomes. In both groups there was only one species represented. 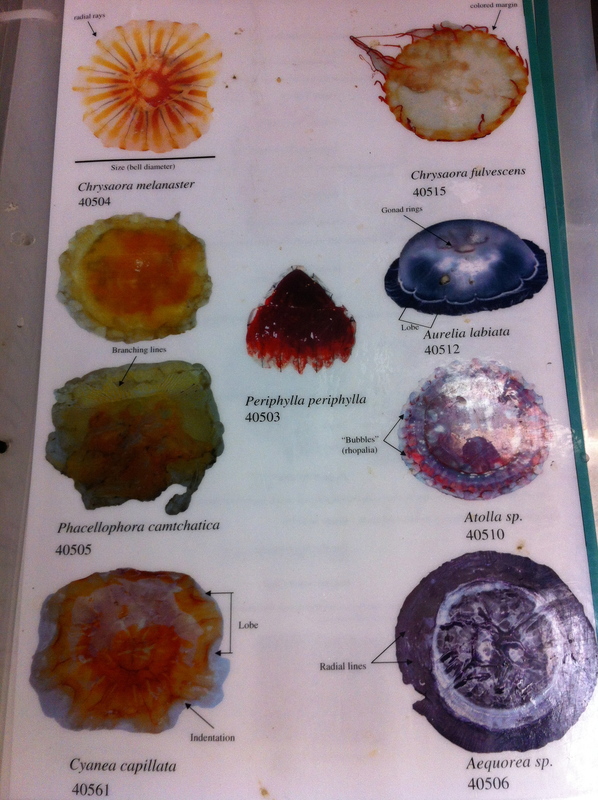 Schyphozoa: We brought up a couple of different species of jellyfish; we used a classification field guide to help us identify them. To learn more about the Cnidaria Family, click the Cnidaria on the picture below, and stay tuned for further exploration of this animal Tree of Life. Can you spot the Cnidarian on the Tree of Life? Click on it to learn more.